Award-winning journalist Simran Sethi explores the history and cultural importance of our most beloved tastes, paying homage to the ingredients that give us daily pleasure, while providing a thoughtful wake-up call to the homogenization that is threatening the diversity of our food supply Food is one of the greatest pleasures of human life. Our response to sweet, salty, bitter, or sour is deeply personal, combining our individual biological characteristics, personal preferences, and emotional connections. 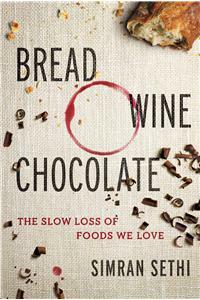 Bread, Wine, Chocolate illuminates not only what it means to recognize the importance of the foods we love, but also what it means to lose them. Award-winning journalist Preeti Simran Sethi reveals how the foods we enjoy are endangered by genetic erosion—a slow and steady loss of diversity in what we grow and eat. In America today, food often looks and tastes the same, whether at a San Francisco farmers market or at a Midwestern potluck. Shockingly, 95% of the world’s calories now come from only 30 species. Though supermarkets seem to be stocked with endless options, the differences between products are superficial, primarily in flavor and brand. Sethi draws on interviews with scientists, farmers, chefs, vintners, beer brewers, coffee roasters and others with firsthand knowledge of our food to reveal the multiple and interconnected reasons for this loss, and its consequences for our health, traditions, and culture. She travels to Ethiopian coffee forests, British yeast culture labs, and Ecuadoran cocoa plantations collecting fascinating stories that will inspire readers to eat more consciously and purposefully,better understand familiar and new foods, and learn what it takes to save the tastes that connect us with the world around us. Simran Sethi is a journalist and an associate at the University of Melbourne’s Sustainable Society Institute and the host of the PBS Quest series on science and sustainability. Her work has appeared on NBC Nightly News, PBS, Oprah, MSNBC, the History Channel, and NPR. She was the national environmental correspondent for NBC News, the anchor/writer of Sundance Channel’s first dedicated environmental programming, and the host of the Emmy award-winning PBS documentary A School in the Woods. She lives in Charlotte, North Carolina.